It's a shame Fishing poles are two-handed. Otherwise you could weild your pole and your best catch. Got my 32 Pound Catfish in Desolace, near Shadowprey Village. Good luck on your achievement! I caught my 32 pounder in the inland water just northeast from Mudsprocket. And STILL no 32 Pound Catfish. Don't expect to catch this in one sitting. I caught my 32 pound catfish at Nek'mani Wellspring. I have spent about 3 weeks now trying to fish a 32 pound catfish up and no luck as yet. I have 12148 catches in Lake Everstill in Redridge and while I have caught a lot of 17-26 lb catfish - still no joy on the 32 pounder. 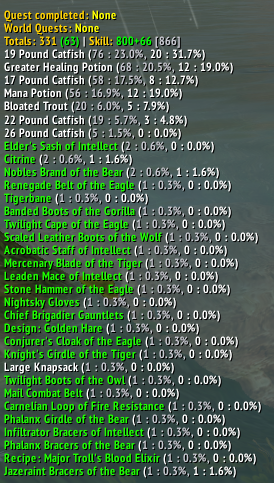 Is this fish still available to catch in 5.1+ WoW or has it been removed? Anyone able to confirm or deny if this thing it catchable in Northern Barrens? Found a whole lot of 17, 19 and 22 pounders so far so it *should* be possible to also catch a 32 pounder, right? Went to the Chromie scenario in Andorhal as advised. First 30 some odd casts nothing. It started raining and had it in 1-2 casts. Lv 800 fishing + underlight angler . It took me 11 chromie runs but i can confirm the 32 pound catfish is obtainable via deaths of chromie. Fishing in the river in the Chromie scenario The Deaths of Chromie at Andorhal, I obtained the 32 Pound Catfish after a total of 418 No Casts. With a base fishing level of 800, Underlight Angler, with Worm Supreme lure, and a Weather-Beaten Fishing Hat (every bit helps!) gave me a total fishing skill of 1065. After fishing up about 3000 fish in various locations with no luck getting my 32 Pound Catfish, I decided to try the Death of Chromie Scenario. Bingo. You need to do the Andorhal Scenario - which unlocks after you do the Emerald Dragonshire - I think that's the first one you do but it's been a couple of months now since I did it so apologies if it's not. Once you start the Andorhal Scenario, you can just run out of the building and start fishing - no need to pick up quests etc. I found a nice quiet little place around 38.8, 74.4 to be a good spot to fish without being bothered. For non-coordinate users, run outside, then its around and behind you to the right down near a tower. Took me eight runs (15 mins each) so around 2 hours - but that was nothing compared to the several days of trying everywhere else. 392 fish according to Fishing Buddy add-on. Wow. Deaths of Chromie scenario, can't believe it worked. I'm approximately 28,000 casts into this achievement since Cata... now that's it done, I feel like the Sylvannas after the death of the Lich King - what now? Finally fished it up at Lake Everstill after, crap. I dunno, somewhere close to 25 thousand casts. I thought it would never drop. May I never find myself obliged to fish up another catfish as long as I . . .
Aw, dang it. Just remembered I still have to fish up Old Ironjaw. Just caught this in about 10 casts in the Chromie Andhoral scenario with level 32 fishing, the basic rod and no lure. 9 years later, finally have the Salty achievement! Did the Deaths of Chromie scenario a couple times to unlock Andorhal (had no idea what I was doing that's why haha). First time in there caught the big boy without any lures or poles with two minutes to spare. Was not raining either! General fishing level was at 167 as well. Unless the drop rate in this scenario was greatly changed recently there's still a little luck element to it, was fully prepared to spend the night fishing. Still, highly recommend this route if you're trying to the achievement. Good luck everyone! This item can be fished in The Deaths of Chromie (5).